Founded by Jerome Monroe Smucker in 1897, J. M. Smucker (SJM) has grown into a leading purveyor of various consumer food products and specialty pet foods that can be found in an estimated 92% of U.S. households. Note that in mid-2018 Smucker sold its baking business, which included the Pillsbury and Hungry Jack brands, to a private equity firm for $375 million. 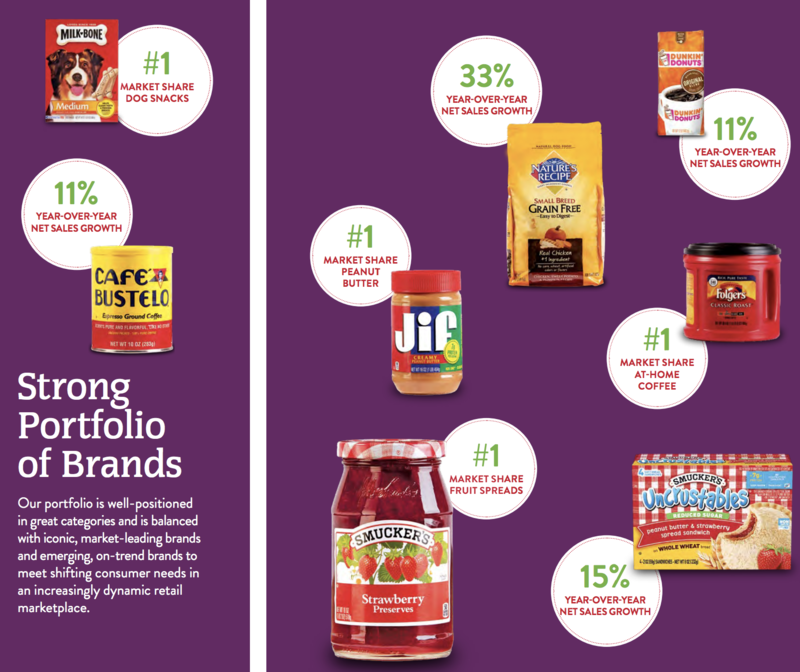 Over the last five years Smucker has realigned its product portfolio away from struggling packaged foods (especially baked goods, frozen foods, and canned milk) and towards stronger growth markets like pet food and snacks. Today the company's biggest sellers are coffee (34% of sales), dog food (11%), pet snacks (10%), peanut butter (10%), cat food (9%), and fruit spreads (5%). Smucker also obtains more than 90% of its sales in the U.S.
Smucker has paid uninterrupted dividends for almost 30 years and raised its dividend for 17 consecutive years. The company's dividend growth rate over that time has been relatively stable at 8% to 9% per year. The company's profitable growth has come from a combination of factors, including maintaining leading market share in its core brands. For example, Smucker owns the No. 1 or No. 2 brands in segments that make up about 75% of its total revenue. Smucker is especially strong in mainstream coffee where its Folgers brand (acquired for $3.8 billion in 2008) is a leader in the U.S. retail market with 26% market share (though that's down from 30% last year). 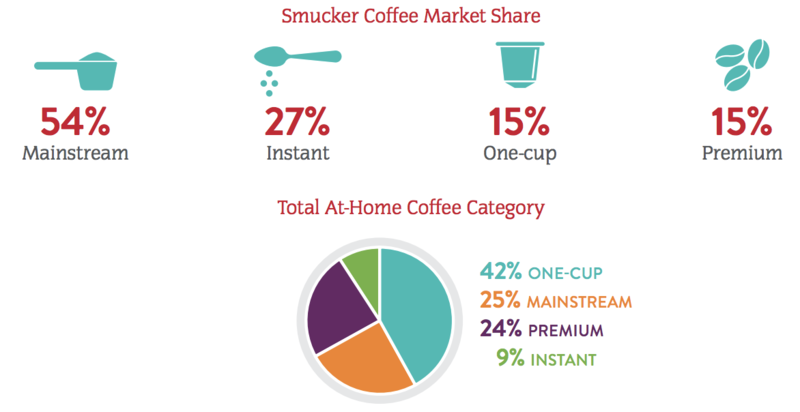 Smucker is also strong in single-serve cups (K-Cup-style pods) where it commands 15% market share in a segment that makes up 42% of industry sales. The U.S. home coffee market is competitive but provides Smucker with opportunities for long-term growth. The market is about $10 billion in size and has been growing at 3% annually over the past five years, about double the rate of consumer packaged goods according to Euromonitor. Smucker's economies of scale, combined with its $450 million long-term cost savings program, has helped the company obtain above-average profitability, with operating margins hovering between 15% and 20% over the past decade. The company's steady profits have allowed Smucker to continuously invest in branding and new product development to keep its portfolio relevant as consumer preferences evolve. For example, the U.S. coffee market is becoming increasingly dominated by single-serve K-Cups, which have hurt the company’s coffee volume growth in recent years. To adapt, Smucker made strategic acquisitions such as its $360 million purchase of Hispanic coffee brands Cafe Pilon and Cafe Bustelo in 2010. The Bustelo acquisition, in particular, has been a big success, with sales doubling since 2014. The company also partnered with Keurig and Dunkin' Brands to distribute Dunkin' K-Cup packs, which have enjoyed double-digit annual growth. Outside of coffee, Smucker’s has been busy introducing new products under its strong brands. Snacks such as Uncrustables sandwiches and Sahale premium organic nuts are an important focus as management hopes to double the size of the company's snacking portfolio over the next five years. Meanwhile, in peanut butter, Smucker is launching more organic brands and snack bars to drive growth. Smucker estimates that its high-growth brands, which account for just over 25% of company-wide revenue, will grow at a high single-digit pace over the next five years, helping drive overall sales growth. While organic growth driven by new product launches and increased marketing spending is a core part of management's plan, acquisitions have been the largest source of Smucker’s growth historically, with the company having done over two dozen deals since 1963. Most of these acquisitions have been successful, including the 2008 Folgers deal, which boosted sales by 50%, and the Big Heart Pet Brands purchase for a whopping $5.8 billion in 2015, which allowed Smucker to enter the relatively fast-growing $32 billion U.S. pet food market. The company's most recent major purchase was buying Ainsworth Pet Nutrition for $1.9 billion in April 2018. That was to acquire Rachael Ray Nutrish, a premium pet food brand that will fill in the gap left by Big Heart (mostly mainstream and value pet food) since premium pet food is the fastest growing part of that market. Over the last few years, Ainsworth's sales had grown by about 15% annually, so the deal should strengthen Smucker's overall growth profile. The pet market appears to be an attractive industry for several reasons. First, aging baby boomers are looking for increased companionship as their children leave the home. Meanwhile, Millennials are waiting longer to start families, and pets are increasingly popular stand-ins for children. With an increasing focus on health and natural food products, many pet owners have also shown a greater propensity for paying a premium for healthier pet foods as well, driving stronger brand loyalty. Like many of its peers, Smucker also has a good track record of taking costs out of its business. In fiscal 2018 the company achieved $140 million in cost savings, bringing its total to $300 million over the last few years and putting it on track to hit its $450 million target by 2020. However, Smucker realizes the importance of investing in its business for the long term and plans to increase its marketing spending from 5% of revenue to 7% in 2019. Overall, Smucker believes it can generate 2% to 3% annual sales growth and 5% annual operating income growth over the long term. Earnings growth is expected to average 8% annually thanks largely to share buybacks, and Smucker's dividend has potential to achieve a similar pace of long-term growth. The bottom line is that Smucker appears to be a potentially solid choice for conservative dividend growth investors. However, as with all packaged food companies, there are several risks that could challenge the company's long-term growth profile. Almost all packaged food companies face three main risks. First, the industry is experiencing a brisk pace of change in consumer preferences as spending power gradually shifts from older Gen X and baby boomers to Millennials and Gen Z. Specifically, many food companies are struggling with consumers’ increasing preference for fresh foods over packaged offerings. This is making the center of the store (where Smucker dominates) even more competitive. Constant innovation and new product launches are required to compete for market share in several market segments that are in decline, such as baked goods and certain oils. In fairness to Smucker, evolving consumer tastes and preferences aren’t a new risk to the industry, and the company has proven itself adept at responding to an evolving consumer market over its 120-year history. However, the U.S. packaged food market is highly competitive and difficult to grow in, even for many of the historically strong brands Smucker owns. In fact, according to research firm Global Data, Smucker has lost pricing power in market segments representing 78% of revenue, indicating that management may not be able to deliver its expected top and bottom line growth over the long term. Besides stepping up its marketing spending and investment in developing new products, Smucker has also responded by diversifying its portfolio through acquisitions, a strategy which brings several challenges. The first is the potential to overpay, especially to gain entrance into faster-growing markets, such as pet food. To win a bidding war with Church & Dwight (CHD), in 2015 Smucker paid a 13 times EBITDA multiple to purchase Big Heart. Less than four years later, Smucker recorded an impairment charge related to its pet food segment, recognizing it likely overpaid for this deal. "At over 22 times approximate $85 million in EBITDA, the purchase price for Ainsworth appears rich... However, after giving effect to $25 million of anticipated first-year cost synergies, the multiple falls to a somewhat more reasonable 17.3 times. In addition, the high purchase multiple is partly justified by Ainsworth's rapid annual sales growth, which has exceeded 15% in recent years." In order for the Ainsworth deal to work out, management will have to succeed in integrating distribution networks, continuing strong sales growth over time, and delivering on the expected cost synergies, none of which is guaranteed. However, the company's track record on M&A integration is generally good. Smucker's acquisitions also boosted its (debt / EBITDA) leverage ratio to 4.1 in 2018, which is on the high side. Moody's says its favorable outlook and BBB-equivalent rating on Smucker's debt is predicated on the leverage ratio declining by at least 0.3 per year going forward. If the leverage ratio is sustained below 3.0 Moody's plans to upgrade Smucker, but a downgrade is likely if leverage is sustained above 4.0. Not surprisingly, management has said that maintaining an investment grade credit rating is a top priority and by 2023 it expects Smucker's leverage ratio to be cut in half to reach 2.0. As management focuses on paying down debt, investors should not expect much dividend growth over the next few years. However, the end result should be an even safer dividend. And once the 2.0 leverage target is achieved, the payout's growth rate can accelerate to match the company's underlying earnings growth. In the meantime, investors should monitor Smucker's leverage metrics closely. While the firm's debt levels don't appear dangerous today, should the company experience any unexpected and sustained hits to its operating cash flow then it might feel pressure to drastically slow its dividend (or even cut it) in order to divert cash flow to paying down debt over time. For now, this possibility seems quite unlikely. A final risk faced by Smucker is commodity prices, especially in volatile goods such as coffee. A major component of packaged food earnings growth is cost cutting, but rising commodity prices can easily offset several years of hard earned cost savings over the short term. While input cost volatility is usually manageable over time, it's important that any short-term hit to operating cash flow does not throw off Smucker's ability to hit its deleveraging targets. While the packaged food industry is extremely competitive and fraught with numerous needs to adapt to changing consumer tastes, Smucker has proven itself more than up to the task to stay relevant over the past 120 years. With an impressive track record of consistent annual dividend increases and a safe payout (despite somewhat high debt), Smucker could be a decent idea for long-term dividend growth investors to consider. However, investors need to be comfortable with the industry's risk profile and management’s ability to reduce debt and improve profitability going forward, especially following the recent string of pricy pet food brand acquisitions. Short-term dividend growth could slow during this deleveraging phase, but Smucker's long-term outlook appears to remain intact.